Podcasting enables you to subscribe to regularly updated audio material, and then take it with you on your MP3 player and listen to it when it suits you (the term podcasting is clearly derived from iPods, but the practice is not limited to them). As such, it's a combination and application of technologies that gives another glimpse forwards of 'martini media' — being able to listen to (and, to a lesser extent, watch) your selected tracks or programming 'anytime, anyplace, anywhere'. I don't know the difference between 'anyplace' and 'anywhere' either, but you get the idea. Here's a Wired News article on podcasting, with further links and examples. In the same way that RSS feeds allow people to track and read multiple text-based web sites through one interface, podcasting offers the promise of subscribing to multiple audio programmes through one device. In fact, podcasting depends on the latest version of RSS to 'enclose' the audio files. Right now it's a little geeky to implement, and your MP3 player has to be linked to a PC with a broadband connection while it updates. But clearly with time (less than five years?) plus a little workaday graft — no miracle innovations required — that could be turned into something easy and foolproof to use, updated by high-speed wireless connection direct to the player. Here's a re-cap of some of the other harbingers of martini media that I've been collecting, followed by more details of podcasting. Earlier in the year I argued that online radio is the model for listening to music in the future. That's not the same as saying that online radio is the future: it's a model because it combines the elements of (a) dynamic content and (b) control (including the personalisation that that implies). a rumoured wearable satellite radio. 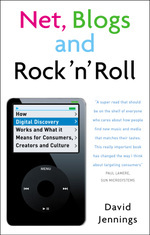 By contrast, the basic digital download model provides control and personalisation, but little scope for refreshing and updating your collection dynamically — which is why I was sniffy about research suggesting that the rise of iPods means the end of radio. Returning to podcasting, a lot of the material produced for podcast available now is the equivalent of self-produced radio programmes — see podfeeder for a significant repository of podcast feeds. You can see the simple step that has been made here: podcasts are to regular radio what blog sites are to print journalism. And that means some of them are pretty good: Adam Curry's Daily Source Code seems to be the benchmark that everyone looks up to, and he has a background as a professional presenter, providing content that seems not to infringe copyrights. Other podcasts I've listened to give the impression that they do infringe copyright, and some show the limitations in the medium. A podcast which is just like someone reading their blog article denies users the capability to 'skim' an article as quickly as a written text. Dave Slusher's Evil Genius Chronicle from a few days ago contains an interesting section where he talks about podcasting arriving as a convergence of co-dependent technologies in the same way that there was a distinct 'steam engine time' in history when all the necessary developments were in place to allow this innovation to come into being. But I can't link you precisely to that passage from here, and if, like me, you don't even know what sport the Red Sox play, you may not be fascinated by the discourse on upcoming Sox games that precedes the passage. When podcasting will get really interesting as a media form is when it breaks out of traditional radio and journalism models and finds the unique things to which it's suited. Maybe record labels could let me subscribe to all the new interviews that my favourite artists do, without me having to scour the schedules and the airwaves to find them? The live sessions on Gideon Coe's programme — currently provided as Real media streams from the hub sessions page — would make ideal daily podcasts. Building on my interest in e-learning and archives, maybe old material can be re-presented as a means for listeners to expand their horizons, understanding the material they like in the context of the cultures from which it grew?